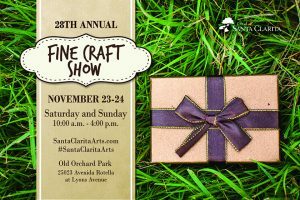 Thank you for your interest in participating as a 2019 Fine Craft Show vendor which will be held on Saturday, November 23 and Sunday, November 24 from 10:00 a.m. to 4:00 p.m. This is a great opportunity to showcase your handmade or hand-embellished items to the Santa Clarita community just in time for the holiday shopping season. Please read below the requirements for being a vendor. *Vendor Applications are now open. Notification will be sent out a week after an application has been submitted. Complete the Credit Card Authorization Form and mail it to the address above. Vendors can begin set up on Friday, November 22 (noon to 6 pm), or Saturday, November 23 (at 6:00 am). Security will be on site overnight on Friday and Saturday (5 pm to 7 am). Event staff has the right to move vendor booths at any time. Upon approval, a small percentage of alternate items may be permitted, but must be listed on the application. Mass produced or commercial products are NOT eligible. Layout and presentation of the park are based on the needs of the Fine Craft Show. Event Staff will evaluate all booths and contents to ensure product quality, presentation, and fulfillment of the handmade requirement. Ability to participate in future Shows is contingent upon this factor, and if not in compliance, you may be asked to breakdown and leave the show. Vendor space is open to fine arts, fine crafts, photography, and select unique gift items. You MUST supply a current resale number. To obtain a R/S number at no cost, call the State Board of Equalization at 1-800-400-7115. Vendors are encouraged to begin set up on Friday, November 22 from noon to 6 p.m. Space assignment and set up will also be Saturday, November 23 at 6:00 a.m. Booths must be completely set up by Saturday at 9:00 a.m. All vendors must be at their booths at this time for a mandatory walk through. Any vendors without weights or stakes will be told to break down. Any vendors selling non hand-made items will be asked to breakdown. Security will be on site overnight on Friday and Saturday from 5 p.m. to 7 a.m. Vendors must obtain all permits required for food sales and preparation from the County of Los Angeles, Department of Health Services, no less than one month prior to the Show. Health requirements for food stands, health permits, and sales permits must be met at all times and made available for inspection if required. L.A. County Dept. of Health Services – Santa Clarita office: (661) 287-7000. Food vendors must submit a photo of their booth. Booth size is 10’x10′ for each application fee of $150. Corner space requests are $50 more. “Extra space” beyond one foot on each neighboring side of the booth may be considered as an additional chargeable booth space. Vendors will receive additional information including parking instructions two weeks prior to the Show. This information will be sent via email or postal mail only if you do not have email. Vendors may unload from valid parking areas on Lyons Ave. or in the small lot on Avenida Rotella. Immediately after unloading, vehicles must be moved to one of the side streets or parking lots off Lyons Ave. Please be considerate and allow parking on Lyons Ave. to be utilized on the weekend by Show patrons. We will provide you with a map of available parking areas. The City of Santa Clarita is not responsible for ticketing or citations given to vendors parked in designated No Stopping/No Parking Zones/No driving on grass at anytime. All spaces are approximately, but not less than, 10 feet wide x 10 feet deep. Vendors must provide their own supplies, including chairs, tables, canopies, weights and/or stakes is mandatory or vendors will be asked to leave, etc. Floor-length table coverings are required. Displays must be clean, orderly, and professional. Any back stock, boxes, packing materials, bags, etc., are to be out of sight at all times. We encourage you to have side and front walls or the ability to cover up merchandise overnight.